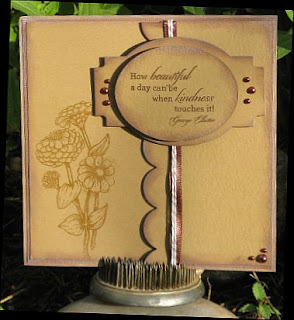 Sonnet Designs: It's all about Kraft! I believe I used the Zinnia stamp set. I also used some MFT dies and sponged the edges with SU chocolate chip ink. Lastly, I added some pearls, ribbon and twine. I hope you like it and have a happy Monday. How beautiful! I really love all the die cuts and layers! I'm so glad you could join us in the Flourishes Timeless Tuesday challenge this week! Hi Janet, gorgeous card - love the colour and the sentiment is beautiful.